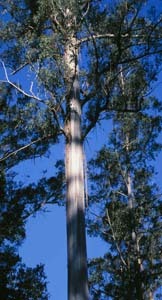 Eucalyptus regnans is a dominant species in tall, wet forest, where it can grow to be a massive tree (the tallest hardwood in the world). 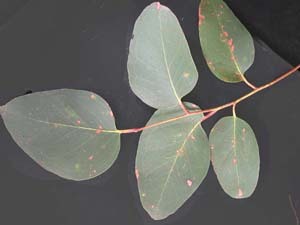 Like E. delegatensis and E. obliqua, the adult leaves are relatively large (often >10cm long and usually more than 3cm wide), and have asymmetrical bases. Only the lower part of the trunks are covered in fibrous bark (unlike E. delegatensis and E. obliqua, in which fibrous bark reaches to at least the upper branches). The common name for this species is problematic. 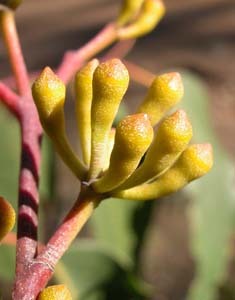 It is sometimes called Swamp Gum, but this is better applied to E. ovata. 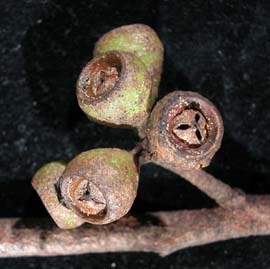 In Victoria, E. regnans is called Grey Mountain Ash, but this is not often used in Tasmania. 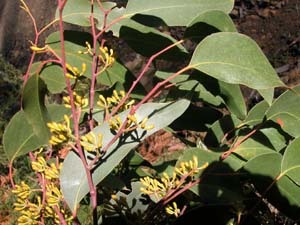 "Giant Ash" has been proposed but is not widely used at present.